This guy looks so cool on his Yike Bike. Image courtesy of Yike Bike. This series has presented some fairly incredible alternatives to 3+ wheeled transport: bikes made of cardboard, uni-wheeled motorcycles, and Danish cycles that shelter you from wind in what looks like a banana or that park up walls. Now we introduce -drum roll please- the ultraportable Yike Bike. The “droid” like Yike Bike, as highlighted in a blog post by Atlantic Cities, recalls the early 19th century bikes of old, with the front wheel, massively larger than the other. These bikes, whose wheels were taller than the person riding them, existed in a time before the chain-driven cycle, which allowed far more efficient means of propulsion. 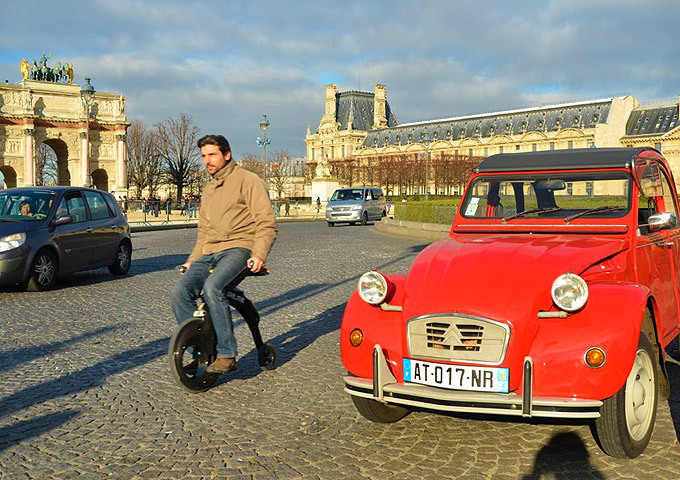 Today, the Yike Bike brings the quirky joy of the past and meshes it with the electric motor of the present. The design is simple: the rider sits above “the big wheel” using controls on the pedals to control acceleration. The innovation known on conventional bikes as “handles” give way to the space age notion of using body weight alone to guide the vehicles to the left or right. Misgivings may abound about the safety of these 25 pounds of portability. For example, they leave the rider exposed to objects of all sorts and the Yike Bike can’t brake well when going down hills on a full battery charge. The creators of Yike Bike have presented this fairly convincing video of these little guys’ mettle, effortlessly climbing up sidewalks one-half-an-iPhone tall, or through potholes one-half-an-iPhone deep. However, the Yike Bike doesn’t move too quickly and is light enough to maneuver in an emergency. Where health and road safety come first in mobility, the Yike Bike excels in keeping par with other bikes…whose range is much longer and whose propulsion uses human calories burnt, not electricity spent. It makes this blogger wonder, “why don’t you just use a Segway?” The answer may well be that they just don’t look as cool. Friday Fun: It's A Bird! It's A Plane! It's a ...Gondola!